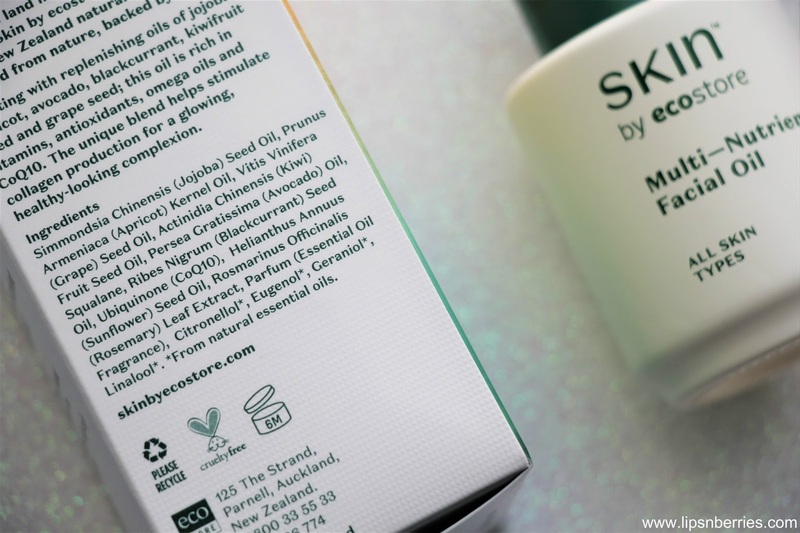 SKIN by ecostore Skincare Range Review | LIPS n BERRIES! You know how much I love natural skincare! & God forbid if its a NZ brand..I just have to try it. 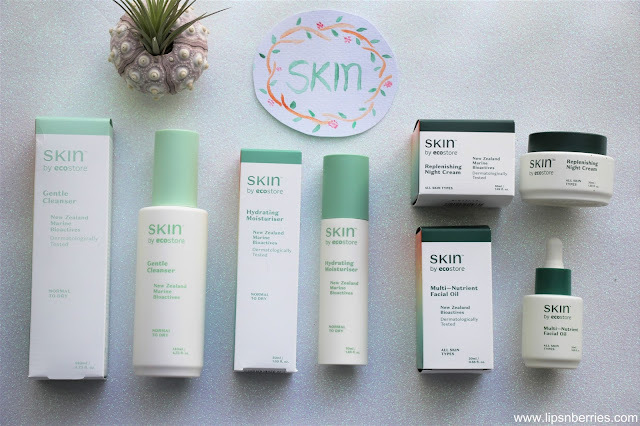 When Ecostore NZ approached me to try out their new skincare range, you bet I was excited! I've previously loved their shampoo, conditioner & body wash. Their dishwashing liquid and home cleaning products are a mainstay in our home. Heck! they are pretty much the pioneers of eco-friendly packaging here in NZ (ever heard of renewable sugarcane plastic?). No wonder I have a sweet spot for them. Ecostore already had a whole line up of bodycare products. 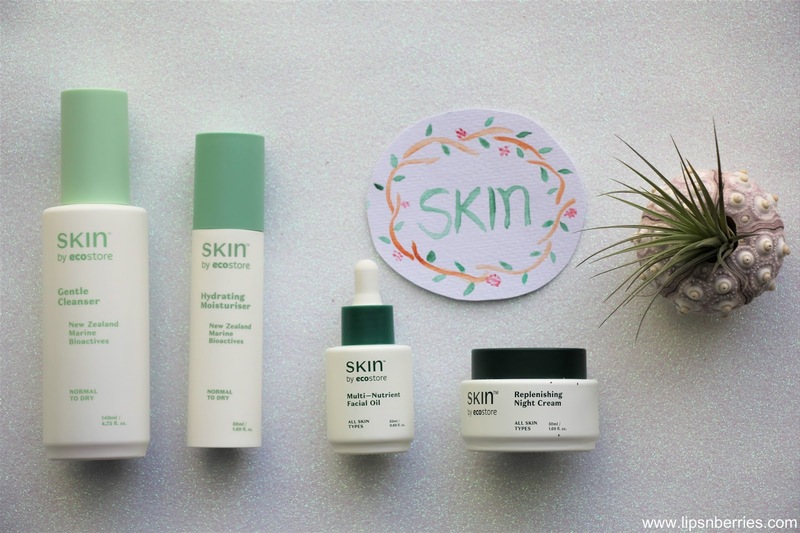 They have now branched into Skincare with their new range 'SKIN by ecostore'. The ingredients are sourced from New Zealand's pristine land & water. The range boasts antioxidant rich NZ Marine extract, Grape seed extract and Blackcurrant oil. 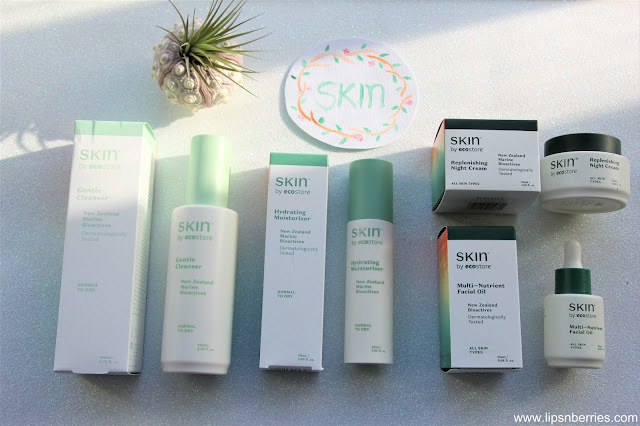 I was sent 4 of their their dry skin specific products to try out. I've been using them religiously for about a month now. I made a point to not use any other skincare line this past month. I didn't spray on my HG Savar hydrating toner. I did not use my serum and nor did I use my soulmate Rosehip Oil. Shock horror right! Those who know me know that these products are my non-negotiables. They travel with me everywhere. I didn't want to give this range any benefit of doubt. The point being, if I had any dry patches or dullness after a month's usage, this range wouldn't be for me. Long story short, I love them! 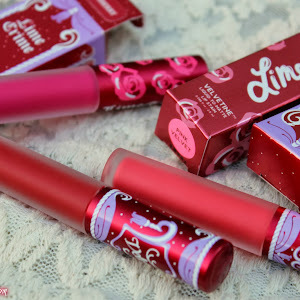 I did not expect to like the products so much. 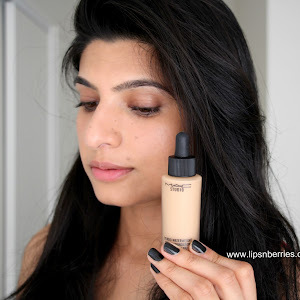 Even in these dry winter conditions, my skin is the same as before, a touch brighter maybe! If I had the lip balm & hand cream from their new range, I wouldn't have used any other products for my skincare routine. Oh hey Ecostore if you reading... please add an eye cream & toner to your range and we can be bff's. Serious! 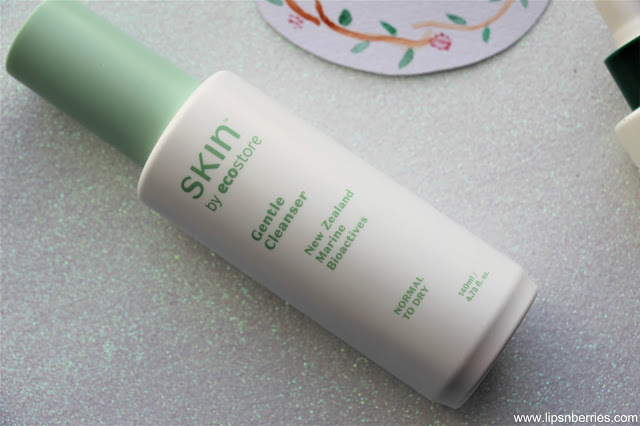 The brand markets this as a gentle cleanser for normal to dry skin types but can I say this is actually suitable for all skin types and not just dry skin peeps. Husband has combination skin and he likes it. I've found that its creamy but doesn't leave a layer of oil/moisture on skin. You actually get squeaky clean face even with a tiny pump or two. I'm used to gentle cleansers that are pretty much creams in disguise but this one can actually clean up pretty good. You do have to moisturise after this, more so with dry skin. The cleanser has NZ seaweed, Avocado, Grape seed extract, Blackcurrant oil and Calendula to clean, soothe & nourish skin. I love this! I can even use this after makeup remover and not worry about foaming cleanser. I prefer using this as my morning cleanser though. It's not easy staying away from your favorite moisturiser for a month but I think I did just fine without my Holy Grail 'Clinique Dramatically Different Mositurising Lotion'. I used SKIN's hydrating moisturiser every morning before work. The off white colored semi-lotion is a treat to use first thing. The subtle botanical scent is a killer! 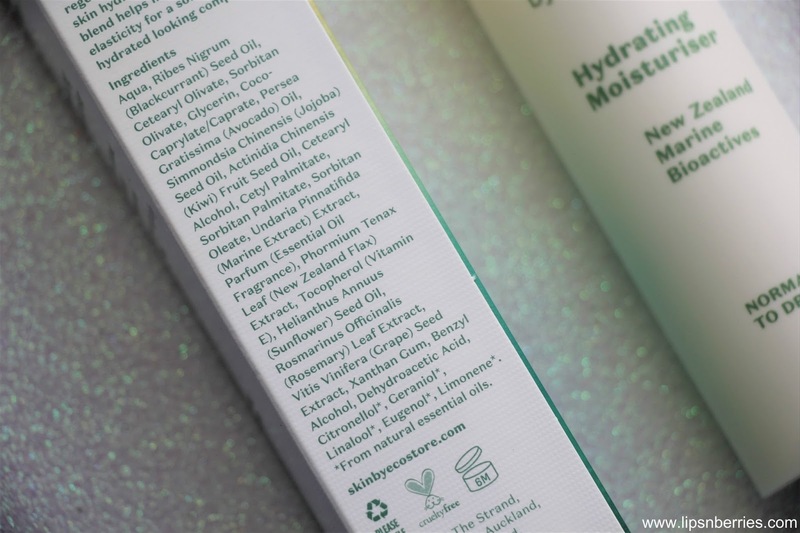 Moisturiser takes about 20-30 seconds to seep in. 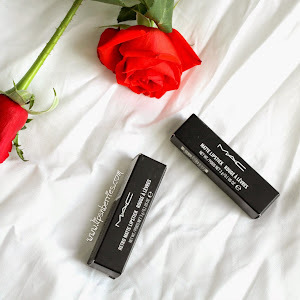 I am able to apply my MAC Next to Nothing foundation right on top of it a minute later. Auckland traffic has me out of home in flat 25 minutes from the time I get up! I like my morning routine to be fuss free. The last thing I want is waiting for my moisturiser to absorb in, so SKIN clearly doesn't disappoint. Its not sticky at all and rather leaves me with matte, moisturised skin. My face feels great all day. I've had no dry or itchy patches whatsoever. It must be doing its job. The product is again marketed towards Normal/Dry skin but honestly the way it sits matte, I feel it'll be just fine for all skin types. SKIN claims that the product nourishes, hydrates and regenerates skin. I couldn't tell if my cells are regenerating (ummm...?) but my facial skin definitely feels quenched! They also recommend this be layered with their Multi-Nutrient Facial Oil. I tried it last weekend and followed with my foundation, using a beauty blender. Foundation went on like a dream & ze face looked visibly hydrated, healthy and glowy. Love! For once, I'm glad they mention this one as all skin types, because like all other products I tried, it sure is! This off white/beige-y cream spreads beautifully and absorbs right in, leaving matte complexion. I swear I could use this as a day cream and no one would know. I like my night creams to be tad heavier on the moisture side so this one leaves a bit of room for me. Hence, I say this is definitely all skin types. The cream takes a minute to disappear. Even though it feels matte on my overly dry skin, I've had no problem wearing it alone every night. I've had no tight, itchy or dry skin the next morning. Though I definitely enjoy it more, when layered with their facial oil. These two go together beautifully and my skin is visibly glowy and hydrated when I get up next morning. 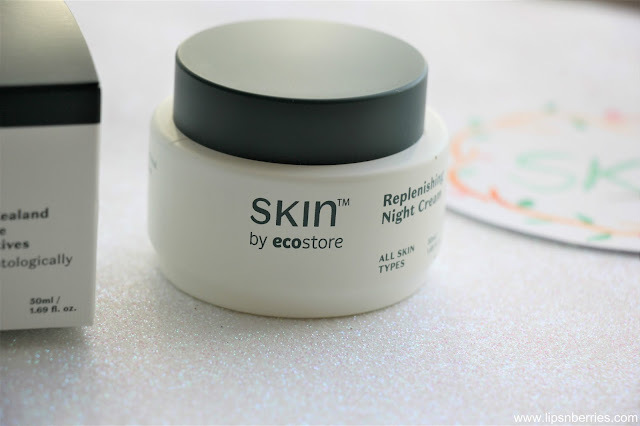 So for dry skin types, I suggest following this night cream with the SKIN's multi-nutrient oil or any other oil you use as per your night time routine. It works ok with Rosehip Oil as well. I found the results to be better with the same brand oil though! I saved the best for last. This has to be my favorite of the bunch. I love skincare oils. They are a staple in my night time routine. Over the weekend, I slather on nothing but oils. Sometimes multiple times a day! Its my weekend ritual. This one feels so beautiful on. I remember loving Skinfood NZ's Coco+Nut oil this much. 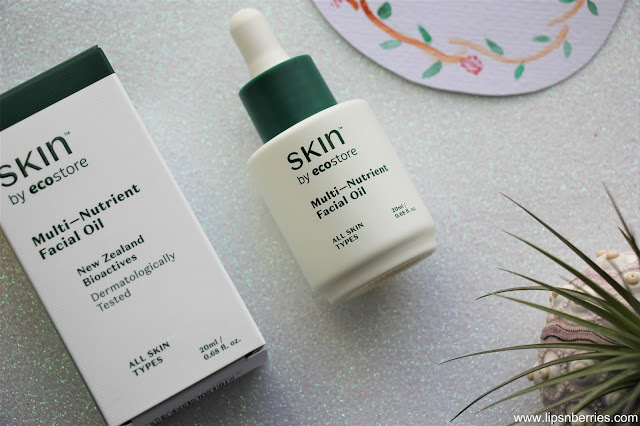 This multi-nutrient oil is just perfect. With my Rosehip Oil, I feel most it either disappears into skin or ends up on pillows by morning. With this one, I feel it on my skin when I get up. More so if I've slathered it on after applying their night cream. My skin literally glows in the morning. I also like that the oil sits/absorbs nicely over most skincare products. There's no peeling off. That's my pet peeve. 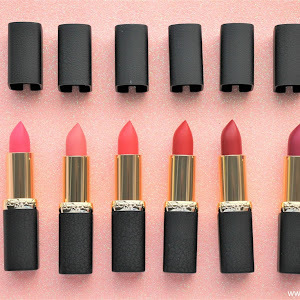 I hate products that rub off when layered with another product. The matte-white dropper-style glass bottle has avocado, blackcurrant, apricot, jojoba, kiwifruit seed & grape seed oils in it. Hence rich in vitamins, antioxidants, Omega oils and CoQ10, the famed ingredients for skin rejuvenation and collagen production. I highly recommend trying this one out. Its for all skin types. I'm definitely purchasing this again. For the amount we use 20ml isn't going to last long in our household! I feel 'SKIN by Ecostore' have definitely put a lot of thought into their products. They are aesthetically pleasing in white & sea green matte packaging. For a range available in supermarkets, the luxury feel to their products cannot be ignored. 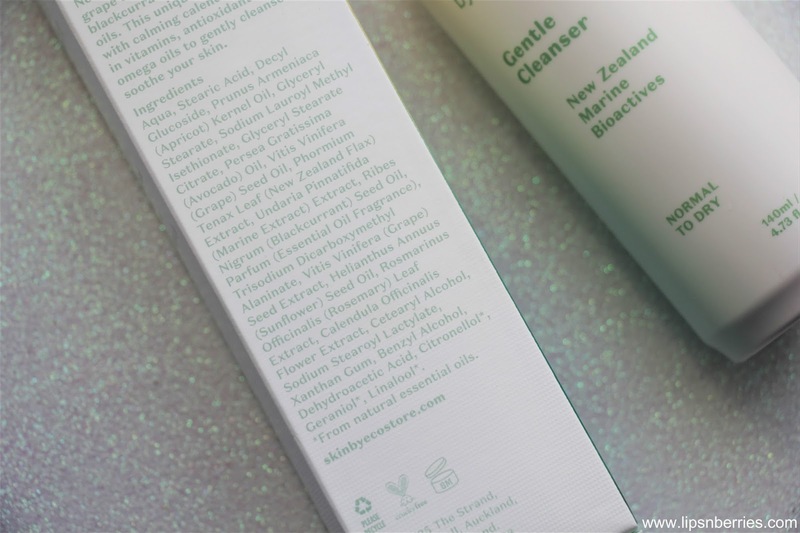 I also love that their ingredients are sourced in NZ and they are 100% cruelty free. I'd really like to try more products from their range, specially the Manuka Lip Balm & their Rejuvenating Body Moisturiser. By the way, they also do Oily/Combo skin specific products. You can check out more of their range on Ecostore NZ website. 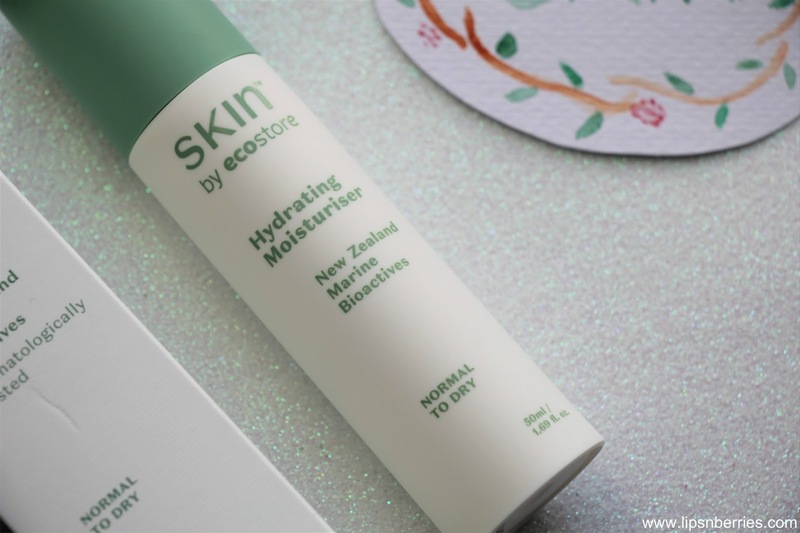 I'm happy that kiwis get to try the best of skincare at a good price. Well done Ecostore! 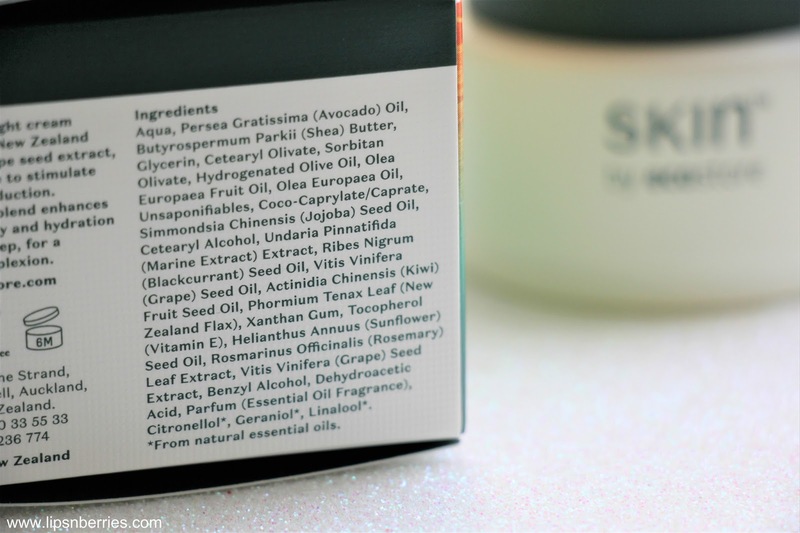 Are you a fan of natural skincare? What's your favorite natural product? Talk to me in the comments below.